Sometimes an issue comes up that requires you to make a ticket. This is not difficult to do but often people are unsure on how to use the ticket system so I hope this little guide will help. 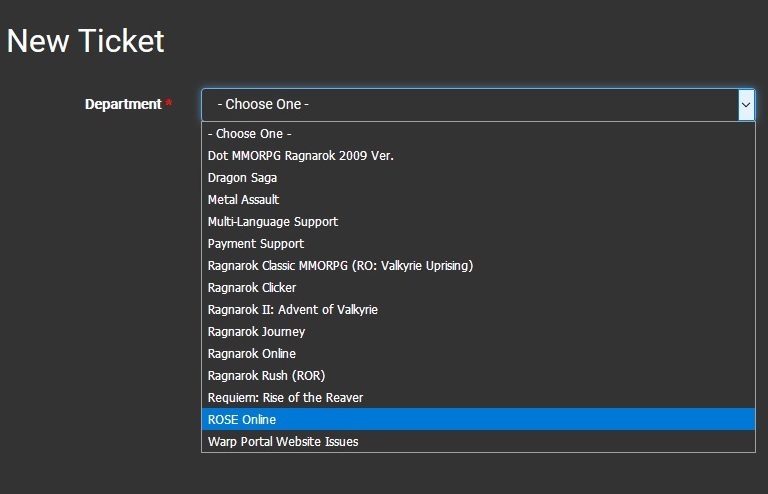 Go to the ROSE (or WarpPortal) website and click on support at the top. That will take you to the support page. Just to clear up any confusion, you do NOT have to log into your WP account to make a ticket. 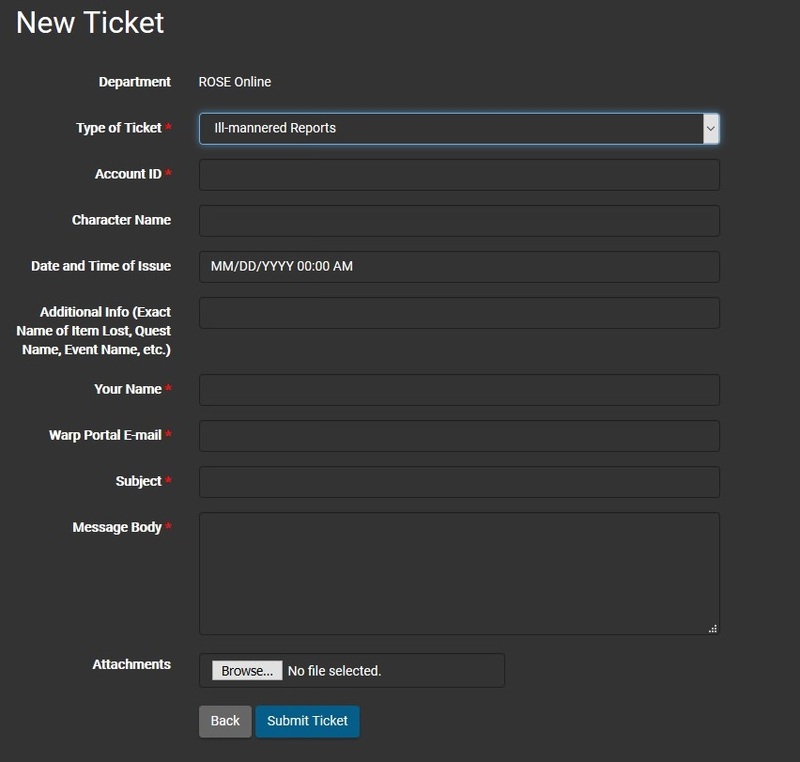 However, there is a place in the ticket itself where you must list the email that your WP account is connected to and that’s where correspondence regarding your ticket will be sent. If you prefer to reply to your ticket at the website instead of waiting for emails. Click on register at the top of the support page to make a support account. This account is NOT the same as your WP account; it’s a completely separate account that allows you to check your tickets at the website.. If you decide to make a support account, here is information on how to find your tickets. The new page that opens when you click “continue" is the ticket itself. Items with a red * are mandatory; they must be filled in before you can submit the ticket. - Bug Reports- Anything in the game that you feel is a bug. - Ill-Mannered Reports- Choose this if you are reporting another player for botting, duping, harassment etc. Be sure to attach your documentation and remember that support will never tell you the outcome of their investigation of another player. - Technical\Web Support- This option is for problems with the forum or website or issues logging into the game. Pick this if you are having problems buying WPE or any issue with Item Mall Points. Message Body- This is where you should explain exactly what the issue is. Be as accurate and detailed as possible so support can help you. Directly below is where you can attach up to 5 screen shots or other documentation that is related to your issue. To attach a file, click on “browse”. That opens a box on your pc. Click on the screenshot, document, etc then when you click “open” , that item will be uploaded and attached to your ticket. Any screenshots attached should not be edited or cropped in any way. You can add more than one attachment by clicking "browse" again after you have added your first file. Look over your ticket and make sure everything is correct and that all of the important fields are complete then click “next” at the bottom of the ticket form. NOTE: You must click “submit ticket” to complete and send your ticket. The page that opens when you click on “next” will give you your ticket number. You should keep that handy until your issue is resolved. Once you have submitted your ticket, an automatic email is generated, telling you that the ticket has been received by support. You should check for that email to be sure it hasn’t been misdirected to the spam folder by any email filters you might have. Since some issues take longer to resolve than others, you should be patient when waiting for a reply from support. Keep checking your email (or at the website if you made a support account) in case they ask for additional information. Do NOT make multiple tickets about the same issue. That will actually slow the process rather than speed it up. Edited by HoneyBunz, 06 September 2018 - 12:24 PM. Please check your email's spam folder in case the replies have been misdirected to spam. If you have not heard from support since you received the automatic reply that is generated when you first submit a ticket, please send the ticket number and a brief explanation of your issue to CM AndraSyte here at the forum. She can look into the status of your ticket. I think there was a maintenance on the support page earlier today. It looks like the menus are the same but the page itself looks different now. You should try making your ticket again now that the maintenance is over. Then it has a link to do that but when I click on it it just takes me right back to the same screen. Actually, it seems the issue has been resolved. It was an issue about items being given to me to give to his 'main' yet he never came to get them. When I just logged my vendor account back in (thinking it was offline due to 'client stopped working' as it does sometimes) the items are now gone. Which was what I wanted to happen....scary situation. Should I assume the situation has been handled now or still submit a ticket?